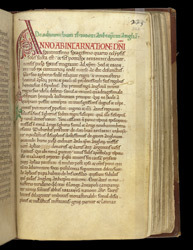 While most of the manuscript's writings concern St Augustine, the Roman monk whom Pope Gregory the Great sent in the late 6th century to convert the Anglo-Saxons and who became the first archbishop of the English, one section has lives of the archbishops of Canterbury and other saints important to the monastery. On this page, an account of the arrival of Theodore of Tarsus and his colleague Hadrian begins. Theodore of Tarsus, a Greek-speaking Syrian, furthered Christianity in Britain by organising the church and its administration as well as bringing the intellectual culture of the Mediterranean to Kent. Hadrian, the African-born abbot of Nerida near Naples, became abbot of the monastery of Sts Peter and Paul (later St Augustine's). The scene opens with a solar eclipse, foretelling the death of archbishop Deusdedit in 664. The three-pointed decoration on the tail of the first letter refers to earlier Anglo-Saxon art--a reminder of the monastery's ties to the beginning of Christianity in England.